The picture below shows a Swift Connecting Link Press-Fit Spring. Thousands of other top quality spares listed on our website at refreshingly low prices. Press-fit links are approximately 80% the strength of a regular link, and require the use of tools (long nose pliers or mole grips) to fit. Never attempt to hammer a press-fit link on: this may cause damage to the link. 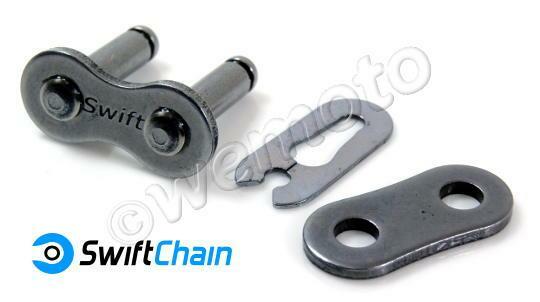 Loose-fit links are not as strong as press-fit, but are more convenient to install and remove as they do not require specialist tools.here. Always ensure the spring on any spring-type link is installed with the open end trailing.